North Korea appears to be preparing to test-fire a ballistic missile that could be capable of striking the western United States, a South Korean official and reports said Tuesday. The move comes amid heightened tensions on the Korean peninsula, with the North declaring last week that it was abandoning pacts designed to prevent hostilities with the South. The two Koreas technically remain at war because their three-year conflict ended in 1953 with a truce, not a peace treaty. Relations have been tense since President Lee Myung-bak took office a year ago with a tough new policy on Pyongyang, and rhetoric from the North Korean capital has escalated in recent days. Analysts say the communist regime is trying to attract President Barack Obama's attention as he formulates his North Korea policy. Obama told Lee that Secretary of State Hillary Clinton would visit Seoul in mid-February. South Korean intelligence has spotted a train carrying a long, cylinder-shaped object - believed to be a long-range missile - heading to Dongchang-ni, a new missile launch site on North Korea's west coast, the Yonhap news agency reported. Intelligence indicates the missile is likely a long-range Taepodong-2 model, Yonhap said. The North could complete preparations for a missile launch within one or two months, the report said, citing unidentified officials. South Korea's Defense Ministry declined to comment on Yonhap's report. But an intelligence official confirmed there are indications Pyongyang may test-fire a missile. "There are signs North Korea is preparing for a missile launch," the official told The Associated Press. He declined to give any further details and spoke on condition of anonymity, citing the sensitivity of the issue. The Taepodong-2 - considered the North's most advanced rocket - has a range of more than 4,160 miles, putting Alaska in range. However, the missile being readied for a launch may be an upgrade of the Taepodong-2 missile, said Koh Yu-hwan, a North Korea expert at Seoul's Dongguk University. The North reportedly has been trying to develop an advanced version of Taepodong-2 capable of striking the west coast of the mainland United States. Japanese government officials also cited preparations for the launch of an upgraded Taepodong-2, the Sankei newspaper reported in Tokyo. Officials at Japan's Defense and Foreign ministries could not be reached for comment Tuesday. Any missile launch would be aimed at drawing Washington's attention as well as pressuring Seoul into softening its policy on Pyongyang, said Park Jung-chul, a North Korea expert at the government-funded Korea Institute for National Unification. "It's designed to draw U.S. interest at a time when the North's nuclear program is being sidelined by the global financial crisis and the conflict in the Gaza Strip," Park said. Koh said he doubted Pyongyang would fire a missile anytime soon because such a test could derail its goal of establishing relations with the Obama administration. "North Korea has nothing to gain" from a missile launch right now - but could fire off a missile if negotiations with Washington do not go well, Koh said. North Korea's clandestine missile program has been a key regional concern, along with its nuclear weapons program. 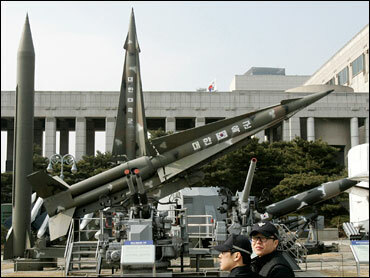 In 2006, the North launched a Taepodong-2 missile from its east coast site in Musudan-ni. The test was considered a failure because the rocket plunged into the ocean shortly after liftoff. Last year, North Korea tested the engine of a long-range missile, indicating progress in developing a new missile, U.S. and South Korean officials said. North Korea is not believed to have acquired the technology to develop a nuclear warhead light enough to be mounted on a missile, another South Korean intelligence official said. He did not give his name, citing department policy.